Easter is now less than a week away! It’s so late this year, so I seems like we’ve been talking Easter for a long time! But Easter is such a perfect time for all the cute adorable treats! Next to Christmas, I think it’s my favorite holiday for goodies, maybe even more so, because there doesn’t seem to be the pressure Christmas has. Any way…….I just grabbed a cake mix and fixed it up using the Perfect Cupcake from a Box “recipe. Mixed up a batch of Butter Cream Frosting and got to work on a few fun Spring and Easter Cupcakes. Easter is one of those holidays that’s full of fun! Coloring eggs, eating chocolate bunnies, jelly beans and peeps, and gathering with family. 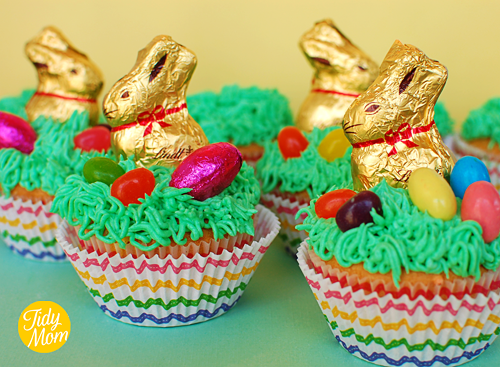 How about some Easter candies on top of a cupcake! Snip outer sides of gummy lifesavers using small scissors. Place Dots in center of rings. Insert sucker stick in each ring and place on top of frosted cupcakes. 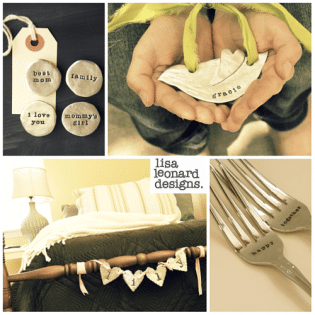 Follow Cheryl Sousan | Tidymom.net’s board Easter crafts and recipes on Pinterest. 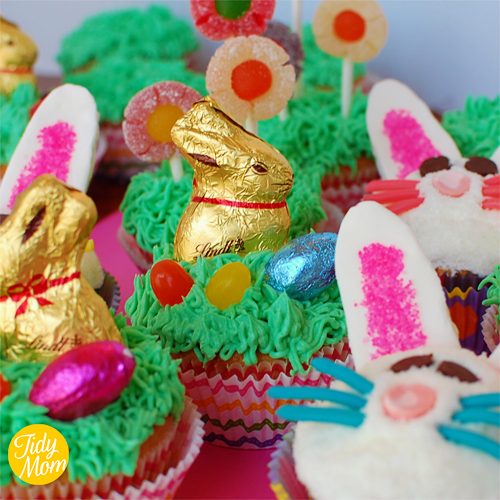 Hurry and get baking………..Easter’s on it’s way! Hope you have a Happy Easter! 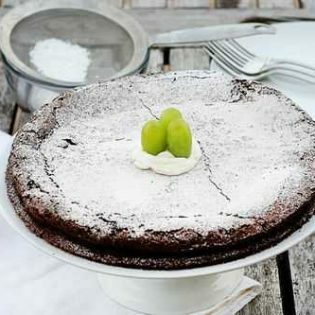 Feel free to share what Easter treats you’re baking in the comments, or upload a picture to the TidyMom Facebook Page! How festive and darling! That frosting grass is AWESOME! How cute are those? What a great Easter treat! Adorable! I love, love, love the Spring Flowers! I just bought and recently used the grass icing tip myself and had a lot of fun with it. Adorable! 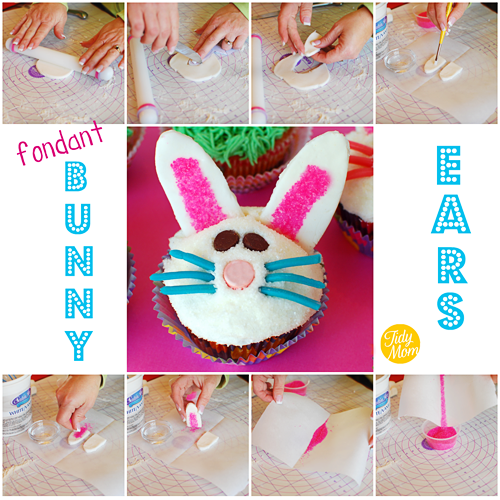 I have never been brave enough to try fondant, but this looks cute and easy!!! I love them ALL! Too cute! These are so cute, Cheryl! 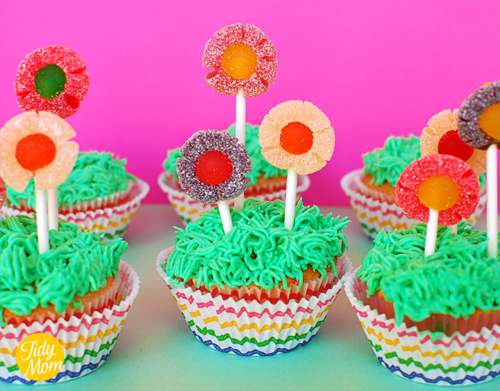 I love that you could use the flower cupcake idea all Spring long. Love this. 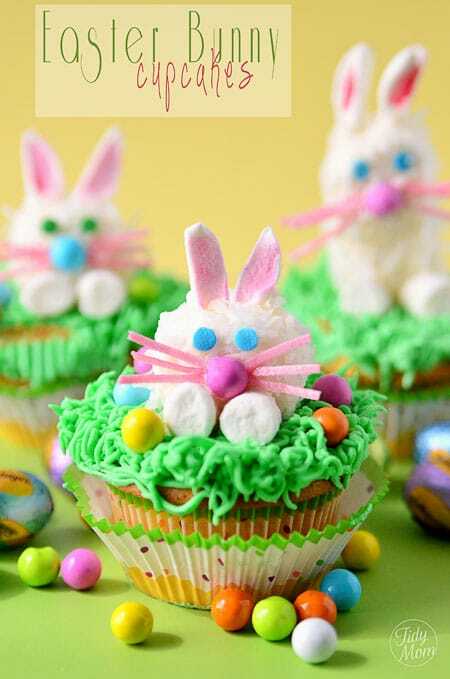 Can not wait to try to bunny cupcakes! Thanks for the idea. Happy Easter!! These are adorable! What an awesome Easter treat! So festive! wow!!!! they are so cute!!! I love all of them, but especially the flower ones!!! 🙂 super cute! 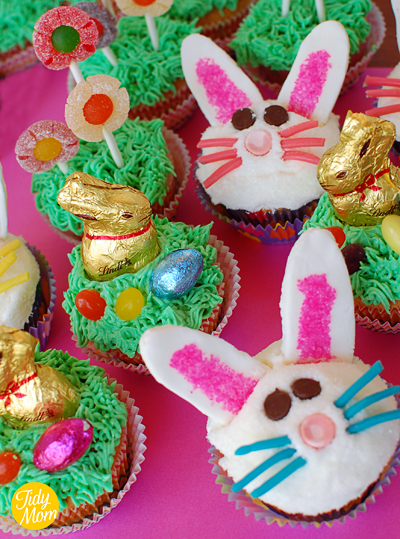 Cheryl…you are the Easter cupcake QUEEN!!! Wowza…so cute! I love all your different designs! And cupcakes are always a huge hit at my house! These are SO adorable! Love them!! LOVE the bunnies! So incredibly adorable! Adorable! I totally just ordered the #233 frosting tip. A must have! They’re gorgeous. I really want to get one of the tips that does the grass. It looks great. Happy Easter! I agree with Jamie, the bunnies are my favorite too. I love those giant ears. These are all so adorable Cheryl! Love them! Thanks for sharing all your awesome ideas and talents! I love the inspiration you give your readers! These look sooo cute! I am sure the kids love them! Will have to try them out. Looks like you had quite alot of fun! They are all so playful and colorful – love them! These are soooo adorably cute!!! I love looking for blogs with a lot of inspiration and I sure found it here!!! Got a new blog, I’m a new baker and enjoy making lots sweet bakes!! Your cupcakes look so great. I love the “grass” and your little spring flower pops. These are amazing to look at – and I bet they taste delicious too! The designs are so impressive – great job! Those are super cute. I wanted to make cupcakes but didn’t get the time to this year. Ah I LOVE the bunnies! So cute. I just finished making bird’s nest cupcakes for Easter.